Ring in the New Year with a Honey Orange Mimosa Cocktail. Paired with a Honey Walnut Cookie, these recipes are great for parties, a girl’s night out, brunch, or breakfast and dessert in bed. Let’s bring in the new year with a few of my favorite things. Our Honey Orange Mimosa Cocktail + Honey Walnut Cookies are a perfect match for ringing in the New Year. And if you love mimosas you’ll love our version sweetened with deliciously aromatic Don Victor® Orange Blossom Comb Honey Globe Jar. Our mimosas take a little extra work because we’re using fresh squeezed orange juice, but if you don’t have the time for freshly squeezed orange juice use an unsweetened or organic variety. Either way, they’ll be extra delicious with the sweetness of Don Victor® Honey. Why Don Victor® Honey? Well, that’s easy. We love Don Victor® Honey because it is raw, filtered honey, and not heated or processed. You can pick up Don Victor® Honey at your favorite local Walmart located in the Hispanic aisle. You will notice its unique packaging with the golden honey inside. You will also notice the also edible honeycomb! Yes, edible! The honeycomb is a special treat and we love eating it right out of the jar, or top in a hot bowl, or oatmeal or fresh fruit. You can also break the honeycomb into small pieces and slather it over warm spread whole wheat toast, English muffin, or hot just out of the oven biscuits! Pro-tip: Wrap goat cheese along with a fresh sprig of Rosemary and Thyme overnight. Unwrap the cheese and drizzle it with Don Victor® Honey. Serve with toasted bread points or whole grain crackers. If you love a good goat cheese this is next level enjoyment. Also, store honey at room temperature for best results. I have also enjoyed Don Victor® Honey drizzled over a bowl of vegan vanilla ice cream or delicious creamy Greek yogurt. And if you want the ultimate honey glazed ham for Easter, well, Don Victor® Honey is up for the job. I also make fantastic Honey Glazed Buffalo Wings using Don Victor® Honey. 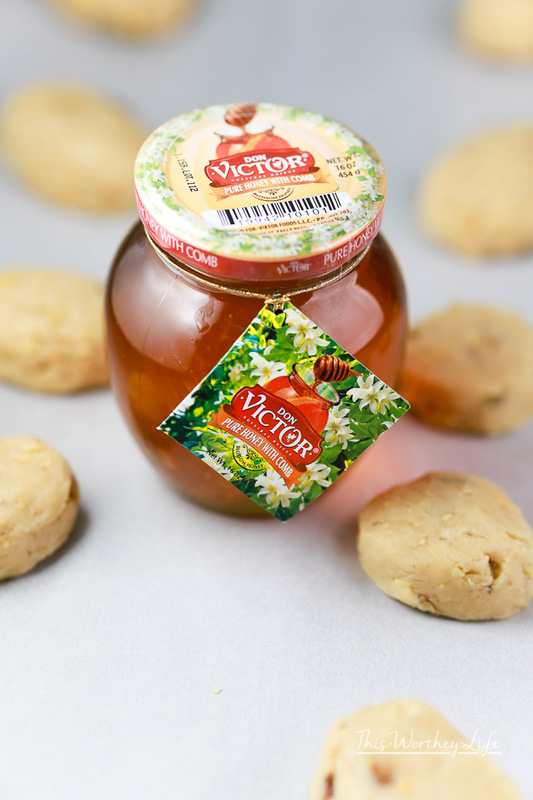 With a love for food and a little imagination, the possibilities with Don Victor® Honey are endless. These are just a few suggestions but I am certain you will come up with a few wonderful ideas of your own in no time flat. Check below for our recipe pairings, perfect for a New Year’s Eve celebration! Finish cookies with drizzled Don Victor® Honey and top with a whole walnut. In a large bowl add the softened high-quality butter, light brown sugar, and pure vanilla extract. Using a whisk, mix until the ingredients become smooth. Add the roughly chopped walnuts and mix until they are evenly spread throughout the mixture. Little by little add the flour, I used a dough mixer until the mixture started to come together. Next, add the Greek yogurt and continue to mix until the yogurt is fully incorporated into the cookie dough. Form the cookie dough into a ball and place it in the center of a length of plastic wrap, pull the plastic over the cookie dough and flatten using your hand or a rolling pin. Chill the cookie dough in the fridge for up to an hour or until you are ready to use it. Remove the cookie dough from the fridge and using a melon-scoop press out cookie dough into the palm of your hand. Press the cookie dough into a little disc and place them on a parchment paper-lined cookie sheet. I made twelve cookies and reserved the rest of the cookie dough for later. Place the cookies on the center oven rack and bake for 15-minutes or until the cookies are a nice golden brown. Remove the cookies from the oven and allow them to cool for 10-minutes, then brush them with Don Victor® Honey, you can also break off small pieces of the honeycomb, and sprinkle them with pulverized pieces of walnuts. Into a cocktail shaker add 3-4 ice cubes, orange juice, and Don Victor® Honey. Secure the lid and shake vigorously for 30-seconds. Remove the lid and strain into a champagne flute halfway, top off with your favorite chilled champagne. While you’re getting all of your party supplies, be sure to stop by Walmart and pick up a jar (or two of Don Victor® Orange Blossom Comb Honey Globe Jar. You can find Don Victor® Honey at Walmart in the Hispanic Aisle. Get more recipe ideas and inspiration by going to their website, and following them on Facebook and Pinterest. How do you plan to celebrate this New Year’s Eve? Drop us a line and let us know. And as always, drink responsibly and never drink and drive! Love, love, love this! I’m thinking about hosting a brunch soon and this would be perfect! Well, I must say that I LOVE how much you love this! And of course please serve this at your next brunch, I agree, it would be perfect. Salud! I wish I would have seen this a couple of days ago. My friend threw a pot luck brunch at her house, and that honey orange mimosa would have been a huge hit. I’ll have to save this recipe for next time. Jeff, that’s too bad! Well, now that you have it saved you have the perfect go-to cocktail for any future brunch gatherings. Cheers! this recipe is a crowd pleaser! it is a must try, and great picture. thanks for sharing this. Thank you, Armelle! And yes, it is quite the crowd pleaser. We made it for friends and everyone was hooked after the first sip. Thanks for dropping by.